Game of Thrones, Season 5 – Unbowed, Unbent, Unbroken – What are you reading? In the latest episode of Game of Thrones, Lady Olenna Tyrell returns to King’s Landing, Cersei tightens her grip, Arya becomes someone else, the Sand Snakes attack, Jorah and Tyrion are caught on the road and Sansa gets married. At the House of Black and White, Arya has become very good at washing corpses. She is meticulous at what she does. But she wants to know what happens to the bodies once they’re washed. Arya tries to sneak through the door that leads to where the bodies are taken, but she’s stopped by the creepy girl who slapped her around previously. Our Rebel is done with washing corpses and wants answers. She says she wants to play the Game of Faces but is told she already failed. Arya gets pissed and asks the girl who she is. The girl spins a tale of being from Westeros and serving the Faceless Men after they helped her with a stepmother problem. But is the tale real or fake? That is the question posed to Arya, which she cannot answer. Back to washing corpses, Stark! Later, Jaqen comes in while Arya is sleeping and asks who she is. She tells her story truthfully and he begins to slap her with a riding crop when he thinks she’s lying. When she gets to the part about hating The Hound, he slaps her silly, even getting her across the face. He tells her she is not ready to become no one. Afterwards, while Arya is cleaning the floors, a man with a sick child comes in and asks Arya for help. At first, she doesn’t know what to do, but then decides to take action. Arya tells the young girl a false story of how she came to the HB&W and gets her to drink the death water. Her friend Jaqen is watching and later takes her to see where the bodies are taken. They enter a huge room full of dead faces. Rows and rows of dead faces, too many to count. Jaqen tells Arya that “the girl is not ready to become no one. But she is ready to become someone else.” Okay. On the road to Meereen, Jorah and Tyrion are still bickering. Tyrion wants to eat something more than berries and would love to have a decent conversation with his traveling companion. Jorah asks if Tyrion ever stops talking, to which he answers that he traveled across the Narrow Sea in a crate without saying a word. Jorah finally asks why and Tyrion tells him about Tywin. He also mentions meeting Jorah’s father, the late Lord Commander Mormont, when he visited the Wall. 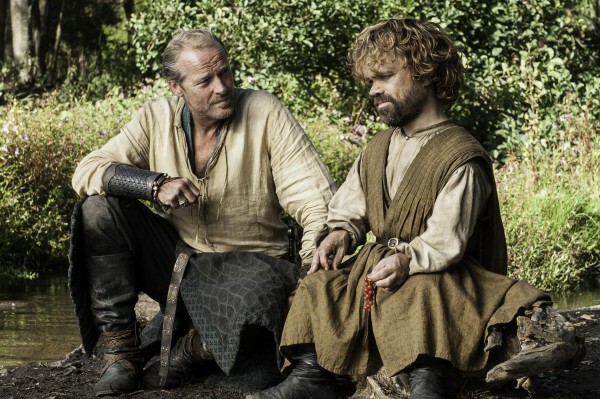 Tyrion lets slip that the Lord Commander was dead, something Jorah knew nothing about. Halfman tells him how his father died, leaving Jorah conflicted. 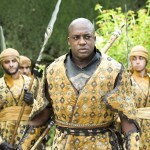 Later, the two stumble upon a group of slavers who decide to use Jorah but kill Tyrion and take his man parts. Since Halfman loves his man parts, he tries to convince the slavers to keep him alive to prove his good luck charm actually came from a dwarf. When one of the slavers says, “it will be a dwarf-sized c*ck,” Tyrion says with conviction, “Think again!” The slavers decide to keep him alive but Halfman goes further. He also convinces them to take both men to Meereen so Jorah can fight in the newly-opened pits. Jorah tells them that he killed one of Khal Drogo’s men in open combat, which puts dollar signs in the slaver’s eyes. Will they finally meet with Dany? Back in King’s Landing, Cersei meets with Littlefinger and Lady Olenna separately and for different reasons. Littlefinger tells her of Sansa’s marriage to Ramsay Bolton, which gets the reaction he hoped for. She sees the marriage as a betrayal of House Bolton and wants them all dead. But Lord Baelish didn’t become a lord for nothing. He plays it just right so that Cersei will wait for House Baratheon and House Bolton to kill each other, and then have Lord Baelish swoop in with the Knights of the Vale to take Winterfell. Cersei agrees, leaving Littlefinger much closer to getting everything he ever wanted. Cersei’s meeting with Lady Olenna isn’t quite so productive, especially when the acid-tongued Tyrell calls her “The tart Queen Cersei.” The meeting goes downhill, as Lady Olenna threatens to break the alliance between House Lannister and House Tyrell unless her grandson Loras is released. Cersei, not one to take threats lightly, makes Lady Olenna pay. During Loras’ inquest, the High Septon calls as a witness the blonde pretty boy from Littlefinger’s brothel, who proceeds to tell all about his escapades with the Knight of Flowers. He also implicates Queen Margaery in the same breath, and the High Septon decides to hold a trial for her and Loras. Lady Olenna knows better and from the look on her face, you know she’s coming after Cersei. 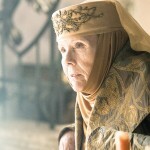 No one messes with Lady Olenna’s house and gets away with it! In Dorne, Myrcella and her intended, Prince Tristane Martell are trying to keep their hands off of each other. The Prince wants to marry Myrcella asap, probably so they can stop sneaking around and finally get at it already. Meanwhile, Bronn and Jaime make their way to the Water Gardens, with the sellsword singing a tune in a surprisingly lovely voice. The two join a caravan to the Water Gardens, where they find Myrcella with her man. The Prince, noticing the bloodstains on their clothes, makes a move against Bronn and Jaime, but gets knocked out for his trouble. Before Jaime can take his niece/daughter away, the Sand Snakes attack and the fight begins. Those ladies were taught well, giving the men a run for their money. One of the Sand Snakes grabs Myrcella and tries to run, but Prince Doran’s guards intervene and take everyone into custody. And in Winterfell, Sansa’s and Theon’s luck just keeps getting worse and worse. It’s Sansa’s wedding day and only the Seven know how she’s feeling. As she contemplates her upcoming nuptials, Myranda arrives at her door to bathe her. The psycho tries to scare Sansa with tales of the women Ramsay has killed when he grew bored of them. For once, she stands up for herself, dismissing Myranda from her chambers. After getting dressed, Theon/Reek arrives to take her to the godswood for the ceremony. When Sansa steps forward and says that she will take Ramsay as her husband, the smile that creeps up on his face made my skin crawl. You just knew that guy was going to bring nothing but pain to her and he definitely did. Mrs. Bolton was introduced to her new husband in a way that I wouldn’t wish on anyone, with Theon/Reek watching the whole thing. How much more can those two endure? Will one of them finally snap and set House Bolton ablaze? Will Cersei’s stranglehold on the Tyrell’s backfire?